Don’t forget to make your reservations for the IMA Texas Annual Conference April 25-26 in Frisco, Texas. Regular pricing ends on April 19th. This year, we are pleased to have Dennis Whitney, SVP of the Institute of Certified Management Accountants as one of our speakers. You can also meet Dennis at the DFW Networking Happy Hour on April 25th. This half-day Power Excel and one-day general CPE conference provides you a unique opportunity to choose from a wide range of exceptional sessions packed with the information you need to grow professionally, while earning 4 CPE credits on Thursday and up to 8.0 CPE credits* on Friday. Expect to be challenged. Expect to be motivated. Expect to leave the event with new knowledge and new ideas. You will also get to spend invaluable time with peers and vendors in a setting that is ideal for networking. Take advantage of our Regular rates before prices go up and register today! Special thanks to the DFW Chapter for hosting this event. You use Excel 40 hours a week, but do you really know how to unleash the power of Excel? Learn cool secrets and tricks lurking on the Data tab. Learn the ins and outs of Pivot Tables (from the guy who wrote the book on pivot tables!). Create slick charts in a single button click. Add thousands of subtotals in seconds. Learn VLOOKUP tricks. Don’t be tortured by bad data any longer. Participants in the session will receive a copy of Jelen’s book, MrExcel LIVe – 54 Greatest Excel Tips of All Time, a book written to accompany the live seminar. Jelen loves new questions and will incorporate them in the seminar. Send your Excel questions in advance via e-mail or bring them to the seminar. 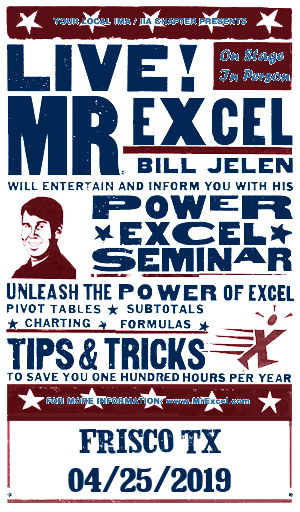 Jelen promises, “If you use Excel 40 hours per week, you will save 50 hours each year by attending this seminar!”. Don’t miss out on seeing “Mr. Excel” live Thursday, April 25 from 1:00 – 5:00 pm at the Drury Inn & Suites, 2880 Dallas Parkway, Frisco, TX. For further information and to register go to http://dfw.imanet.org/events/recentcommunityeventsdashboard. Space is limited, reserve your spot today. Take advantage of our Regular rates before prices go up after this coming Friday, April 19th, and register today! Join Randy Dean, MBA – The E-mail Sanity Expert® – for a powerful day of productivity skills development on time, project, people, e-mail, and device/smart phone management! Randy is the author of the recent Amazon.com e-mail bestseller, Taming the E-mail Beast, and is also one of the most popular speakers on time, e-mail, and related technology management in the U.S. and abroad. Come join him as he provides numerous tips, tricks, and strategies for better managing your time, project, people, ideas, e-mail, information, and smart phone/tablet devices! Most attendees to Randy’s programs walk away with a slew of new tips, strategies and techniques with tools like Outlook, Gmail/Google, and their smart phone/tablet devices for increased productivity, reduced distraction, and better overall performance. 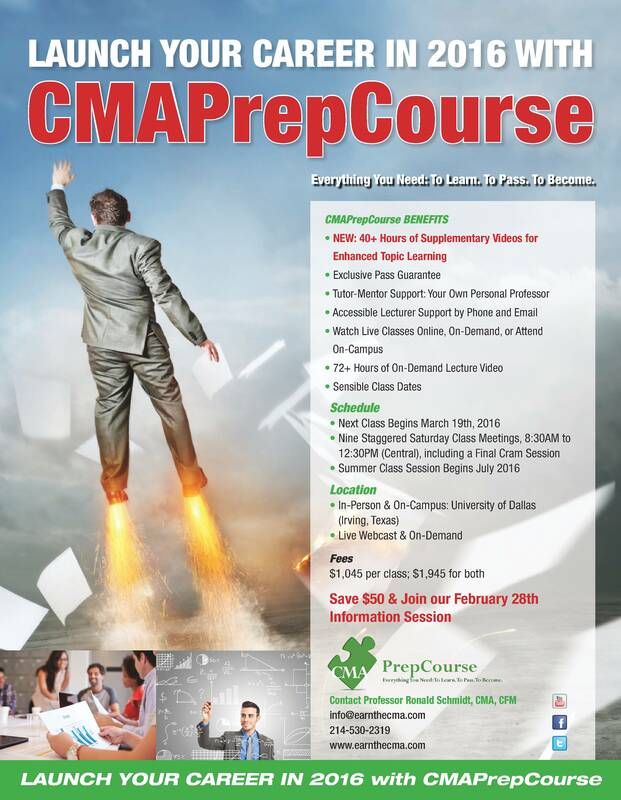 LAUNCH YOUR CAREER IN 2016 WITH CMAPrepCourse: Information session on 28th Feb. The United States recovery is well underway and economic growth in the Dallas Metropolitan area has been picking up. As economic growth continues, hiring managers will find themselves under increasing pressure to both find top-notch candidates and to retain their own staff. The Dallas metropolitan economy has reported moderate growth in the previous 6 weeks, while nationally hiring has picked up. This could lead to increasingly tight labor markets as the national economy continues to recover and more applicants are absorbed amid increased corporate hiring. Given that Dallas’s unemployment rate is currently at only 6.4 percent, local hiring managers should plan carefully for an increasingly tight labor pool. While the national unemployment rate remains high at 7.7 percent, the unemployment rate among accountants is only 4.2%. With such a tight labor market many human resource managers are finding it difficult to fill accounting and finance vacancies. Competing for local college graduates with accounting degrees can be tough, especially if you are not one of the Big 4 accounting firms. It can be done, however, with some clever planning and effort. Having clever recruiting and staffing practices is essential for small companies who cannot engage in national searches and cannot afford to pay top dollar for recruits. Do you need CPE, but can’t attend Dallas Fort Worth Area IMA dinner meetings? Starting with the March 21st meeting, the Dallas Fort Worth Area Chapter is pleased to offer live simulcasts of our meetings, subject to speaker approval. When members cannot attend the physical meeting, they will have the opportunity to watch the presentation in streaming video and earn CPE. Initially, during the startup phase, there will be no charge for members who participate; however, longer term there will be a charge (amount is yet to be determined). The presentations will not be recorded; consequently, they will only be available during the live simulcast. the required amount of time and confirm their participation at various points in the presentation. More details will be available on the website and in the meeting notices. Please be aware that bandwidth and security limitations of your internet connection may prevent you from participating and earning CPE. Please let us know if and when that happens. People are effected by their physical surroundings. That is why many cutting edge companies like Google and Apple maintain expansive campuses with facilities that rival the best private clubs and gyms. Maintaining a comfortable and inviting work space is now essential for increasing productivity and retaining talent. While upgrading offices will require a financial investment the bottom line could improve and you will be more likely to retain your best employees. Retaining your employees is essential for ensuring stability and protecting the bottom line. For one, every time an employee leaves you lose valuable skills. Further, training new employees takes time and can cause disruptions in work flows. As such, it is essential to keep your staff happy and committed to your company. Despite what you might think money is not the only factor for keeping employees committed to your company. Yes, financial considerations will always be important for your employees and no amount of non-monetary rewards will keep employees committed if they are unable to enjoy financial security. Still, once employees are financially secure non-monetary benefits can be very effective in increasing employee retention.